One of my favorite restaurants in New York is Noho's Lupa Osteria. I have been going there for years, and is especially fun at about 11 PM after drinks, as the atmosphere is always lively and never skips a beat. Lupa, like Mario Batali's other restaurant, Babbo, is known for the signature dish, bucatini all' amatriciana. Mario Baltali prepares his bucatini all' amatriciana using guanciale, or pig jowls. Upon further research, I learned that the only way to prepare guanciale is to purchase fresh pig jowls, and dry them for about three to four weeks. Don't get me wrong, I like Mario Batali, but the man clearly has an obsession with lard, guanciale and unusual pig parts. Drying pig jowls in the bathtub doesn't really work so well for a nice Jewish girl, so I decided to come up with a similar recipe using something that I might actually consider working with in my home. In the end, I settled on turkey bacon, which is not only more friendly to my semi-kosher family and friends, but also much healthier. However, you could certainly also prepare this dish with either beef-fry or with bacon, if you prefer. This is essentially my take on an Italian classic. Another thing worth noting is that in preparing the red tomato-based sauce for this recipe, I never add any sugar to the sauce. Rather, I add a handful of baby carrots which add a natural sweetness to the sauce. Prepare the sauce with the tomato puree, tomato paste, water, garlic, spices, baby carrots and butter. Bring to boil and then allow to simmer for about a half an hour until it reaches the desired consistency. Saute the olive oil, red onion and bacon/turkey bacon in a saute pan until fully cooked and add to the sauce. In the meantime, cook the pasta. I use bucatini, which looks exactly like spaghetti, except that it has a hollow, tubular structure. 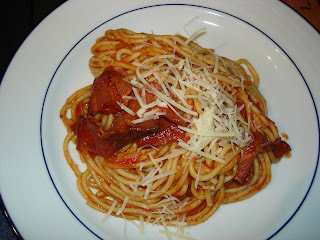 However, if you are unable to find bucatini, regular spaghetti will work just fine. This is extremely tasty, and an easy weeknight meal. There's always plenty of sauce left over for the next night, which is great when you need a break from cooking. My friend Eric hipped me to this dish the first time I ever ate at Lupa. Now I have to get it every time I go there. I like Sasha's alternative to the guanciale, which I usually don't eat though it's essential for the wonderful flavor. Guanciale is obtainable through Italian specialty stores. (In my city, Philadelphia, it's available at DiBruno Brothers.) Pancetta is considered a more than acceptable substitute. However, the Turkey bacon is an interesting twist and worth a try.